Attention bias modification treatment (ABMT) aims to reduce anxiety symptoms via practice on computerized attention training tasks. Despite evidence of efficacy, clinical effects appear heterogeneous. More research on ABMT mechanisms and moderators of treatment response is needed. Age is one potentially important moderator, as developmental differences in training effects may impact response. We examined developmental links between ABMT training effects and response in social anxiety disorder (SAD). We pooled data from two randomized controlled trials in treatment-seeking youths and adults with SAD (N = 99) that used identical ABMT methods. We first characterized learning effects associated with the eight-session ABMT training protocol. We then tested whether learning magnitude predicted the clinical (change in SAD symptoms) and cognitive (change in attention bias) responses to treatment. Finally, we tested whether age moderated the association between ABMT learning and treatment response. Results indicate that ABMT was associated with an incremental learning curve during the protocol, and that learning improved with age. Age further moderated the association between learning gains during the ABMT protocol and subsequent reduction in self-reported SAD symptoms, such that this association was stronger with age. These effects were not evident in bias scores or clinician ratings. Finally, pre-treatment SAD symptoms and bias scores predicted ABMT learning gains. This study highlights the links among age, learning processes, and clinical response to ABMT. These insights may inform attempts to increase the clinical efficacy of ABMT for anxiety. The online version of this article ( https://doi.org/10.1007/s10802-018-0494-7) contains supplementary material, which is available to authorized users. This research was supported in part by the Intramural Research Program of the National Institute of Mental Health (ZIAMH002781-15, NCT00018057). Abend, R., Pine, D. S., & Bar-Haim, Y. (2014a). The TAU-NIMH attention bias measurement toolbox. Retrieved from http://people.socsci.tau.ac.il/mu/anxietytrauma/research/. Abend, R., de Voogd, E. L., Salemink, E., Wiers, R. W., Perez-Edgar, K., Fitzgerald, A., ... Bar-Haim, Y. (2018). Association between attention bias to threat and anxiety symptoms in children and adolescents. Depression and Anxiety, 35(3), 229–238. https://doi.org/10.1002/da.22706. Doyon, J., Korman, M., Morin, A., Dostie, V., Hadj Tahar, A., Benali, H., ... Carrier, J. (2009). Contribution of night and day sleep vs. simple passage of time to the consolidation of motor sequence and visuomotor adaptation learning. Experimental Brain Research, 195(1), 15–26. https://doi.org/10.1007/s00221-009-1748-y. Fresco, D. M., Coles, M. E., Heimberg, R. G., Liebowitz, M. R., Hami, S., Stein, M. B., & Goetz, D. (2001). The Liebowitz social anxiety scale: a comparison of the psychometric properties of self-report and clinician-administered formats. Psychological Medicine, 31(6), 1025–1035. https://doi.org/10.1017/S0033291701004056. Ginsburg, G. S., Becker, E. M., Keeton, C. P., Sakolsky, D., Piacentini, J., Albano, A. M., ... Kendall, P. C. (2014). Naturalistic follow-up of youths treated for pediatric anxiety disorders. JAMA Psychiatry, 71(3), 310–318. https://doi.org/10.1001/jamapsychiatry.2013.4186. Hakamata, Y., Lissek, S., Bar-Haim, Y., Britton, J. C., Fox, N. A., Leibenluft, E., .... Pine, D. S. (2010). Attention bias modification treatment: a meta-analysis toward the establishment of novel treatment for anxiety. Biological Psychiatry, 68(11), 982–990. https://doi.org/10.1016/j.biopsych.2010.07.021. Karbach, J., & Unger, K. (2014). Executive control training from middle childhood to adolescence. Frontiers in Psychology, 5. https://doi.org/10.3389/Fpsyg.2014.00390. Konen, T., & Karbach, J. (2015). The benefits of looking at intraindividual dynamics in cognitive training data. Frontiers in Psychology, 6. https://doi.org/10.3389/Fpsyg.2015.00615. Price, R. B., Kuckertz, J. M., Siegle, G. J., Ladouceur, C. D., Silk, J. S., Ryan, N. D., ... Amir, N. (2015). Empirical recommendations for improving the stability of the dot-probe task in clinical research. Psychological Assessment, 27(2), 365–376. https://doi.org/10.1037/pas0000036. Price, R. B., Wallace, M., Kuckertz, J. M., Amir, N., Graur, S., Cummings, L., ... Bar-Haim, Y. (2016). 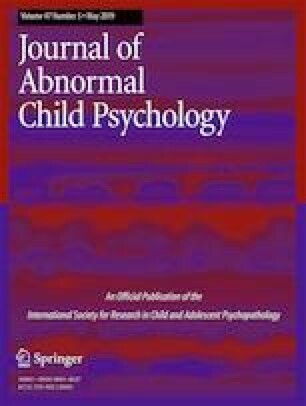 Pooled patient-level meta-analysis of children and adults completing a computer-based anxiety intervention targeting attentional bias. Clinical Psychology Review, 50, 37–49. https://doi.org/10.1016/j.cpr.2016.09.009. Salum, G. A., Mogg, K., Bradley, B. P., Gadelha, A., Pan, P., Tamanaha, A. C., ... Pine, D. S. (2013). Threat bias in attention orienting: evidence of specificity in a large community-based study. Psychological Medicine, 43(4), 733–745. https://doi.org/10.1017/S0033291712001651. Shechner, T., Rimon-Chakir, A., Britton, J. C., Lotan, D., Apter, A., Bliese, P. D., ... Bar-Haim, Y. (2014b). Attention Bias modification treatment augmenting effects on cognitive behavioral therapy in children with anxiety: Randomized controlled trial. Journal of the American Academy of Child and Adolescent Psychiatry, 53(1), 61–71. https://doi.org/10.1016/j.jaac.2013.09.016. Shin, E., Lee, H., Yoo, S. A., & Chong, S. C. (2015). Training improves the capacity of visual working memory when it is adaptive, individualized, and targeted. PLoS One, 10(4). https://doi.org/10.1371/journal.pone.0121702. Tottenham, N., Tanaka, J. W., Leon, A. C., McCarry, T., Nurse, M., Hare, T. A., ... Nelson, C. (2009). The NimStim set of facial expressions: judgments from untrained research participants. Psychiatry Research, 168(3), 242–249. https://doi.org/10.1016/j.psychres.2008.05.006. Wang, Z., Whiteside, S. P. H., Sim, L., Farah, W., Morrow, A. S., Alsawas, M., ... Murad, M. H. (2017). Comparative effectiveness and safety of cognitive behavioral therapy and pharmacotherapy for childhood anxiety disorders: A systematic review and meta-analysis. JAMA Pediatrics, 171(11), 1049–1056. https://doi.org/10.1001/jamapediatrics.2017.3036. Weisz, J. R., Kuppens, S., Ng, M. Y., Eckshtain, D., Ugueto, A. M., Vaughn-Coaxum, R., ... Fordwood, S. R. (2017). What five decades of research tells us about the effects of youth psychological therapy: a multilevel meta-analysis and implications for science and practice. American Psychologist, 72(2), 79–117. https://doi.org/10.1037/a0040360. White, L. K., Sequeira, S., Britton, J. C., Brotman, M. A., Gold, A. L., Berman, E., ... Pine, D. S. (2017). Complementary features of attention bias modification therapy and cognitive-behavioral therapy in pediatric anxiety disorders. American Journal of Psychiatry. https://doi.org/10.1176/appi.ajp.2017.16070847.